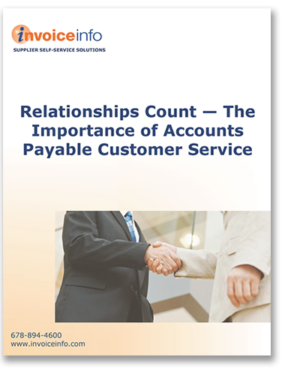 Because accounts payable touches such a wide range of stakeholders, from all the vendors, to employees, to senior management, to various governmental agencies, its operations have a tremendous, though often under-recognized, impact on the organization. #1. Process Improvement. AP customer service provides a window into opportunities for process improvement. Want to know where gaps are in the procure-to-pay process? Customer service calls and complaints indicate the scope of problems and point to specific process breakdowns. #2. Strong Supplier Relations. Secondly, it impacts supplier relations, either positively or negatively. Empirical studies have quantified benefits of good AP customer service versus the cost of poor relationships. #3. Company Reputation. Thirdly, in today’s social media environment, missteps can spin out of control very quickly, where seemingly minor anecdotal incidents become defining truths with real consequences for a company. In its interactions with suppliers, AP carries a lot of responsibility. AP is a front-line representative of the company to the supplier. In some cases, given electronic catalogs and online sales systems, AP’s interaction could even be the first person-to-person contact the supplier has with the company. Read this report to learn why AP relationships are so important and why they count!